What turned innocent Ben Solo into evil Kylo Ren? I blame C-3PO. As little Ben grows up, mommy Leia’s busy as politician and diplomat, spending long days and long voyages to build a new republic and leaving daddy Han Solo as the family breadwinner. So Han’s gone a lot, trading and smuggling with Chewbacca all over the galaxy. Meanwhile, Uncle Luke’s off X-winging with R2-D2, seeking young adepts for his new Jedi academy. Thus Leia and Han leave much of Ben’s upbringing to the nanny who knows etiquette and protocol: C-3PO. But C-3PO, hard-wired to be a servant, isn’t great at handling the willful, emotional Ben. C-3PO knows only one way to calm Ben’s frequent tantrums: Tell him stories like the one he told the Ewoks about Luke, Leia, Han, and grandpa Darth Vader. Ben’s in no mood to consider the often absent Mom, Dad, and Uncle Luke as heroes — but C-3PO’s tales of Vader captivate him. Mom’s trying to patch together fragile coalitions with demagogues and ward-heelers, Dad’s dickering for scraps and running from customs agents, and Uncle Luke’s begging children to go to school; but Vader was a Force-choking badass who could’ve ruled the galaxy. 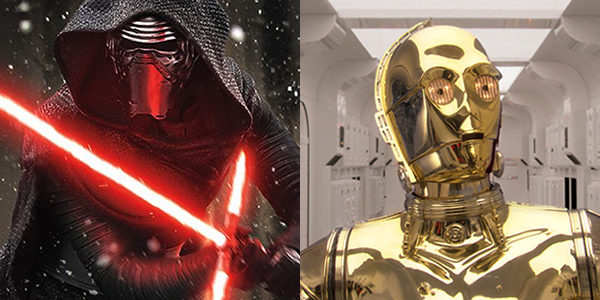 C-3PO’s not very shrewd about human emotion, but eventually he notices Ben’s Vader-worship. He refuses to reveal more about Vader, which only fires Ben’s fascination higher. So by the time Supreme Leader Snoke comes to tempt Ben into joining the Knights of Ren, the young man is primed to go. And it’s all the fault of the family’s loyal droid. What is a Star Wars story? Or: is Luke Skywalker actually Huck Finn? What is a Star Wars story? It’s a harder question than you’d think. Take Star Trek as a contrast. Trek spells out its approach in its opening monologue: “Space, the final frontier. These are the voyages of the starship Enterprise. Its mission: to explore strange new worlds, to seek out new life and new civilizations, to boldly go where no one has gone before.” Immediately, you know that Trek will tell tales of exploration and discovery via a ship in space, full of adventure, mystery, and high risk. Star Wars has no such statement defining its purpose. When I look at Star Wars movies, I see one pattern over and over: a young person who may be a misfit or loner (Luke Skywalker, Anakin Skywalker, Rey, Jyn Erso) comes to contend with and oppose entities bigger and more powerful than himself or herself (the Galactic Empire, the Jedi Council, the First Order, the Force, the Sith). In the process, our hero travels to strange places, finds allies, and has dangerous adventures. From that standpoint, the swashbuckling The Scarlet Pimpernel and The Prisoner of Zenda have elements of a Star Wars story. So do the modern novels For Whom the Bell Tolls and The Kite Runner. And, of course, the movie serial Flash Gordon and Akira Kurosawa’s The Hidden Fortress, which George Lucas has acknowledged as inspirations for the original 1977 Star Wars. For that matter, the picaresque Adventures of Huckleberry Finn has elements of a Star Wars story: a young man and his best friend on the run from an evil institution — slavery, in Huck’s case. I’d love to see Star Wars stories as ambitious and brilliant as Huckleberry Finn, wouldn’t you? I just had a terrible thought. Kylo Ren in STAR WARS: THE FORCE AWAKENS admires Darth Vader and plans to finish what Vader began in the original trilogy. Scary stuff. But what if another STAR WARS character had his own acolytes? Me-sa terrified! Imagine: Over the past decades, legends have been growing around Jar Jar Binks, loyal companion of Jedi Knights and the Queen of Naboo. A Binks cult arises. Hundreds, thousands, MILLIONS of acolytes and wanna-bes bumbling and flapping and jabbering in that annoying whine. And like metal filings to a magnet, they’re heading straight toward the only descendants of his old friends Anikin and Amidala. They’re zeroing in on Luke and Leia, determined to cling to them like mynocks on the Millennium Falcon. I’d rather face a double six-pack of Sith Lords. Finally saw THE FORCE AWAKENS. Liked it, didn’t love it. Comments with minimal spoilers ahead. If you don’t want any spoilers at all, stop here; but I’ve avoided specifics as much as possible. It’s as well-made a movie as you can get. Sets, costumes, sound, special effects, editing, cinematography, storytelling of all kinds: It just plain works. In particular, all of the acting was on point, from the young leads to the old hands. (The movie reminded me, among other things, how good an actress Carrie Fisher can be.) And BB-8 was even more believable and rich in personality than R2-D2, the gold standard of non-humanoid robots. But the movie has no center. The original SW had a lot going on, but it was at its core the story of Luke Skywalker and how a boy becomes a man. THE FORCE AWAKENS, though — well, to avoid spoilers, I’ll say only that its story doesn’t focus so closely on the development of one main protagonist or on one main relationship. Those things are in the movie, but the movie isn’t all about them. So it feels diffuse to me. What’s more, nothing in the movie made me think, “I’ve never seen anything like that before” as, say, THE MATRIX or the 1977 STAR WARS did. It’s a triumph of moviemaking craftsmanship, but not originality, creativity or imagination. Part of the problem is that some scenes and sequences — to avoid spoilers, I won’t detail them — resembled scenes from the original trilogy too closely for me. The filmmakers presented them superbly, almost always better than the originals. But they were still only new versions, not new ideas. And so it went with other aspects of the movie. The music, such a highlight of the original trilogy, was of a high standard in THE FORCE AWAKENS. John Williams’ new themes serve the movie perfectly. But they don’t stand out for me the way his first-trilogy melodies did. Despite my misgivings, THE FORCE AWAKENS lays a great foundation for more STAR WARS movies. Some of them will have better stories and fresher approaches. I look forward to seeing them.